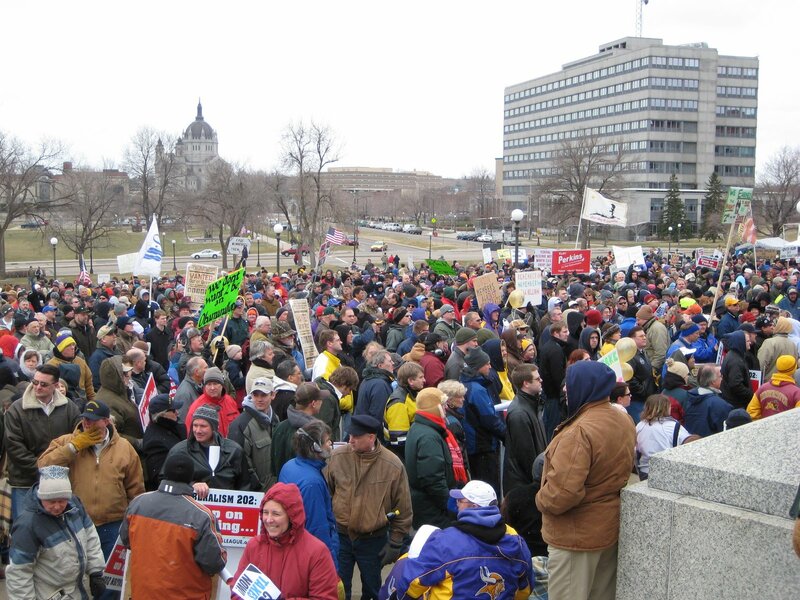 Every year, Republicans (mostly) have a rally at the Capitol to protest taxes. Every year, there’s a minor controversy with a heavy dose of passion that the news media didn’t say more people attended. It’s a talk-radio thing to try to get more publicity for an event after the event, but it’s an interesting exercise. This year is no exception. The rally is the work — mostly — of KTLK talk radio host Jason Lewis, who — for the record — moved back to high-tax Minnesota after leaving here for a few years to work in North Carolina, the state that ranks 40th in tax burden. There’s a metaphor there… somewhere. According to an Associated Press story (MPR didn’t cover the rally), 1,000 people showed up. Additionally, quoting a former DFLer that was NOT at the rally, insults the numerous candidates that were there, running for office, and putting their actions into words about changing the way our government works. The government can NOT spend my money better than me. And as far as I’m concerned, I will not be donating any money any time soon to MPR for their poor reporting and coverage of this important issue. I have my own “counting system” for rallies at the Capitol. I’ve written about it several times on Polinaut. It involves how much “real estate” the protesters occupy. Organizer estimates are notoriously unreliable, as I noted in this post, in which attendance was pegged at 2,000 one year, and 6,000 another year, even though the protesters occupied roughly the same amount of real estate. But using that gauge with this rally is a bit more difficult, because the pictures taken by organizers aren’t from the same spot as with the abortion rally, held every year in January. But here’s one of several you can find on the KTLK site. Which looks a lot like the abortion rally at which the attendance was listed as 3,000. But, it turns out, the stage was set up on the Capitol steps for the abortion rally, but it was set up significantly farther down the mall at the anti-tax rally. Also, the crowd didn’t spill off to the side of stage center as at the abortion rallies, because tents were set up at the anti-tax rally. You can see them on the right in the above picture, and you can see plenty of empty real estate on the left. An educated guess here is that the demonstrators occupied, perhaps, a third of the real estate of the abortion rallies. 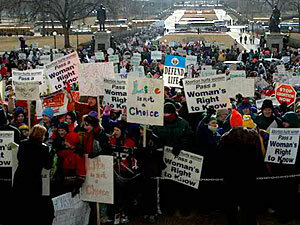 The abortion rallies (as indicated in the link earlier) were pegged at anywhere between 2,000 and 6,000. That puts the weekend tax rally crowd at a range between 700 and 2,000. So, 1,000 is pretty close. And one from the SCSU Scholars Web site. The person caught the error in time. The site says 5,000-7,000. That seems, as I indicated, pretty high. Normally, that would put people in the street. Perhaps we should put an end to these debates by getting about 10,000 volunteers and in 1,000 increments, stand them in front of the Capitol, take pictures, and give us a fair measure. The original full-size can be found here. It appears to be show center, and would appear to represent the largest part of the crowd. How many do you think are shown here? To be the 5-7,000 claimed, there would have to be a spillage to the left and right of the steps, 5-6 times the number shown here on each side of show center. And the above photos show that clearly isn’t the case, especially with the tents on the right side showing there’s no spillover on that side. The 1,000 figure may not be dead on the mark, but it appears to be quite accurate. Opposed to what, taxes or the zeitgeist of the mainstream media? It’s too bad someone doesn’t take a picture from up by the Quadriga (sp?) and count the heads. It seems like a lot of work until you consider the fact that a priest at a church I used to go to stationed a couple of parishioners in the balcony to count the people at mass every Sunday. Certainly you could get someone to do it. How does the National Park Service estimate crowds on The Mall in DC? I heard a story about that once, but I don’t remember how they do it. I heard that the way scientists that study penguins count the penguins is to take a picture and poke a hole in each penguin (on the picture) as they count. That could work with demonstrators too. Opposition to the taxes, Greg. But, yeah, I should rejigger that headline so the paranoid among us don’t flip out. Brian, that would work if you had a picture of the entire crowd in a high resolution. One thing that’s interesting (to me): None of the people complaining about the “miscount” offered up an alternate count. Well, one of your emailers talked about the ‘accuracy’ of the PiPress’s description of “several thousand” people. LOTSA WHITE FOLKS OUT THERE. bsimon, thousands, yes that’s true. And also some blogs reported 5-7,000. See the update I just put up. The original estimate seems closer to the truth. Police estimates also tend to be on the lower (i.e. more realistic) end, too. Organizer estimates are always high because it’s in the self-interest of the organizers to project the idea of a lot of people turning out. If the anti-tax rally numbers were low, it just means only a small number of people don’t care about the future of Minnesota. I’m glad the nature shows I watched as a kid could be of use. I disagree with F Connor. My understanding is that police estimates tend to be too high. They have incentive to do in order to push for more officers, more overtime, etc, etc, etc. Is there a reason that that topic is coming up in regards to a right-wing rally? Police estimates tend to be too high? I have NEVER heard anyone say that ever, and I’ve been counting crowds as long as Bob has. Looking at the full “crowd” shot, I think 1,000 protesters is pretty generous, especially when you look closer and see how spread out that back row is. Lewis has a substantial radio listenership, but apparently most of them aren’t quite so offended by the notion of the state raising taxes to pay for necessary services and maintenance. Which only makes sense as the true conservative position is to always pay for maintenance and upkeep (saves money over the long haul as any property owner knows), but that’s something our Pawlenty-led administration has refused to do. Yeah, mark’s right. I’m thinking that the total might be closer to 800. And as he points out, the rule of thumb has always been cops offer low numbers and organizers offer high ones. So everything’s going according to plan. I can’t figure out which 2 signs undercut the argument, Bob-Don’t leave me hangin’!